What kind of pho paux squabller doesn't like to put a foot in his mouth? Not me. 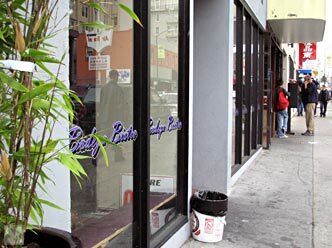 When I want to nibble on some toes, I go to Bodega. Atmosphere: Do you like plum? If so, you are in luck. this purplish-pink, dimly lit restaurant is no frills, but decorated with some ethnic flavor. The ceiling tiles are painted black, the orange cushioned seats and red formica topped tables pull together the whole room completing the effect. This is the best papaya salad ever. 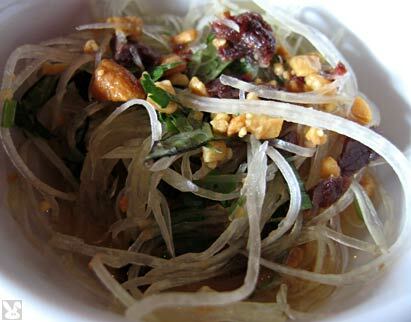 They shred the fruit thinly and top it with little, chewy, pieces of Vietnamese beef jerky, chopped cilantro and peanuts. The light, fish sauce has a hint of heat to it. They toss this salad together at the table. Heaven. This is chicken noodle soup done right. 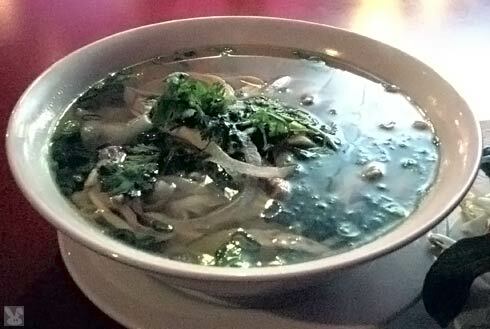 The clear, light, yet chickeny broth is slurpably filled with fantastic pho (noodles.) Thin slices of moist white meat chicken, green onions and cilantro wait for you to give a squeeze of lime, a handful of bean sprouts and some tears of basil leaves to give the full effect. 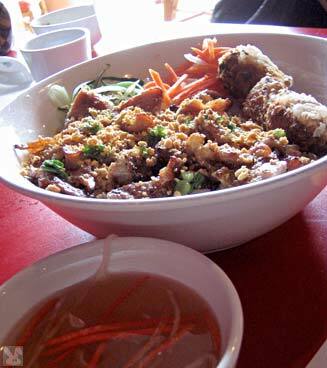 This big bowl of rice vermicelli noodles, chopped lettuce, shredded carrot, broiled pork, chopped peanuts and an egg roll was just the ticket. This tasty noodle dish comes with a dipping sauce that provides a tangy boost for the thinly sliced, flavorful meat. 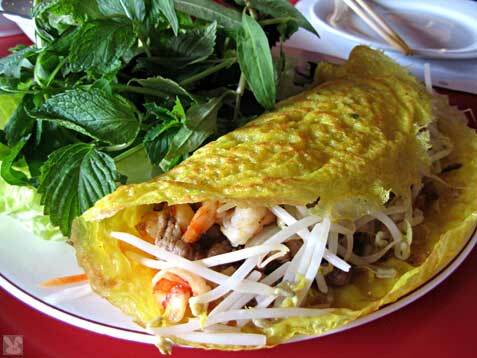 A gigantic, eggy crepe is stuffed with bean sprouts, stir fried shrimp and pork and a wonderful pile of herbs and lettuce. Rip up a bunch of greens and tuck them into this folded pancake, pour on a little of the accompanying sauce and it's delish. 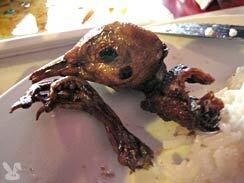 This glazed, roasted squab reminds me of that scene in Eraserhead where they carve up the little birds, but this bird arrives to the table beautifully carved. It's slightly gamey flavor contrasts well with the puckery, peppery dipping sauce. 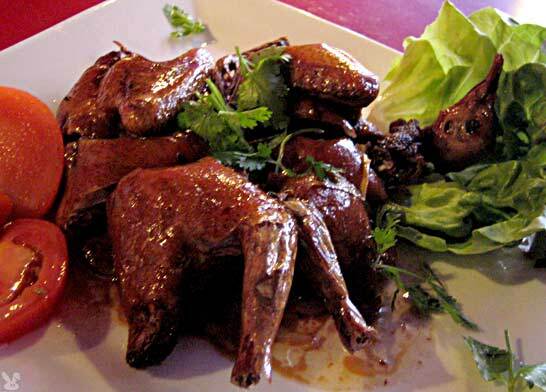 Underneath, there is an onion and golden raisin sauce that adds a pleasant sweetness to the fowl. The tomato slices should be considered a garnish due to their lack of flavor, but don't' consider the bird head and feet as ornaments, No sir, pop them in your mouth beak and all. Yes, the eyeballs too. It's not boney or weird like you might think, it's just more crispy, flavorful entrée. Lots of regulars crowd in to order bowls of tasty noodles. I love the mountains of fresh herbs that accompany many of the dishes. The prices are great for such fun and delicious chow. If you are in the area. This is a good place to grab lunch or dinner. Not the neatest bathroom in the world. Maybe the floors are movie theatre quality because guys are in a hurry to get back to the delicious food.